Woodburn resident Dora Sandoval tackles challenges of providing dental care to people in a new program. When Dora Sandoval of Woodburn arrived at Woodburn High School's Creative Learning Center on Nov. 28, she was visiting familiar territory. But the capacity in which she was visiting is a new one. In fact, it's so new that she is the first and only person in Oregon operating in that role. Sandoval, who graduated from Woodburn High School in the mid 1990s, is Oregon's first community dental health coordinator, or CDHC, described as a relatively new and quickly growing profession across the country. "I was in high school here 22 years ago," she recalled. "And my son was in (Creative Learning Center) programs here five years ago. This trailer is still the same as as it was when I had a 'Child's World' class back in high school." The high school and much of its facilities have changed considerably during that time. So has Sandoval, who has worked in public health for more than 14 years and as a dental hygienist for 17. She is also a part-time clinical instructor at the Chemeketa/Oregon Institute of Technology Dental Hygiene School. In August 2017 she completed community dental health coordinator training and became Oregon's first professional in that capacity. American Dental Association noted that 21 states have community dental health coordinators. Thirty-two state associations recognize the coordinator program, which began in 2006. Additionally, there are 120 students in dental health coordinator training, 275 CDHC graduates, and educational programs are available in all 50 states, many of which, like the one Sandoval completed, are online. Oregon Dental Association describes the community health dental coordinators as front-line health care workers who have a deep understanding of the communities they serve. It's a description that fits Sandoval to a T.
"By serving as liaisons between patients, physicians, dentists, community health centers and other social service agencies, CDHCs are able to connect patients to dentists practicing within their communities," said ODA Director of Government Affairs Jennifer Lewis-Goff. What makes the position unique is the cultural aspect; dental health coordinators are tailored to the communities they serve. Lewis-Goff stressed that candidates are recruited from the same types of communities where they will work, aiming to eliminate language, cultural and other barriers while facilitating trust with their patients. Sandoval's strides within that aim provide optimism in Oregon. "The Oregon Dental Association is excited about this new training program and is looking forward to supporting the career development of other hygienists, like Dora Sandoval, who wish to become trained CDHCs," Lewis-Goff added. Sandoval was born in Mexico. Her family moved to the United States when she was a child, and she learned to speak English at age 10. In addition to her work at Woodburn's Creative Learning Center, she has volunteered with Head Start programs and worked with farm-worker populations. "We work with a lot of immigrant populations, which I love because I get to practice my language and my culture, which I share with the majority of my patients," she said in an article in ODA's publication, Membership Matters. "It is easier to get through to my patients because we share that same culture." 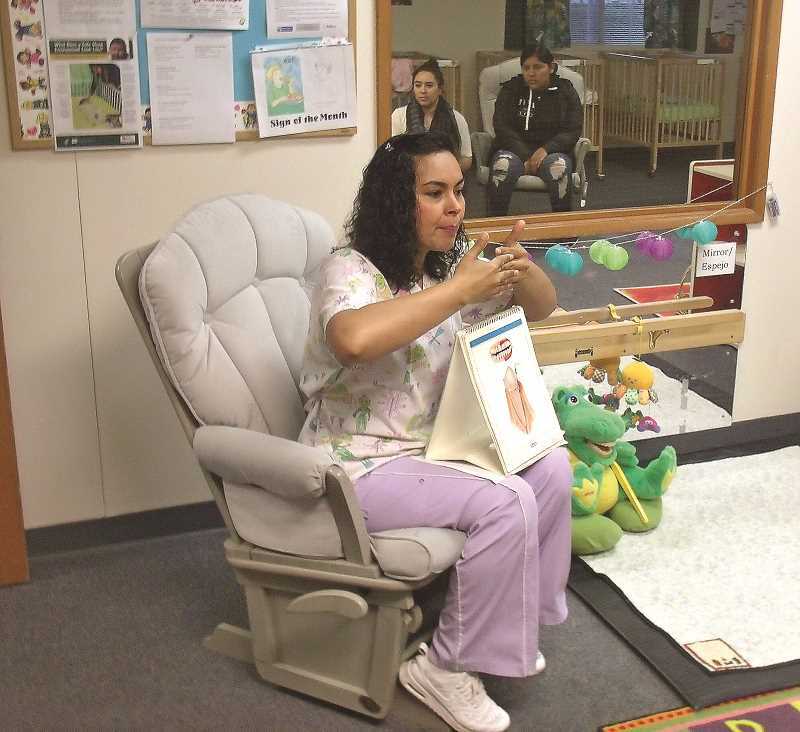 At the high school learning center, Sandoval imparted to young mothers both the importance of oral health care and hands-on techniques to accomplish it. "If we don't take care of our teeth, our entire body is going to suffer," she said, explaining the woes of bleeding gums, gingivitis, early childhood caries (formerly baby bottle tooth decay) and the holistic importance of oral health to a person's overall well-being. "I'm a dental hygienist, so I know the tricks to brushing kids' teeth. A lot of parents don't," she said while propping a green, stuffed dinosaur on her lap. "That's why I bring Alex here with me, to help show you how." Alex sports a gaping jaw with a full set of teeth, perfect chops to to demonstrate proper brushing procedures. He's also a hit and attention-holding visual aid when Sandoval addresses the preschool youngsters directly in a separate session. A prop like Alex is fundamental to the community dental health coordinator's in-person effectiveness — as is the program's cultural emphasis. "It helps that a lot of people in Woodburn know me — I've lived here and gone to church here for a long time," Sandoval said in Membership Matters. "Every summer in Woodburn there is a big Mexican parade. When we participate in the parade, I always hear the little kids saying as we go by, 'There goes my dentist!' It's really fulfilling to have that kind of love from my patients."